We have been busy preparing saint costumes for our upcoming All Hallows' Eve party! 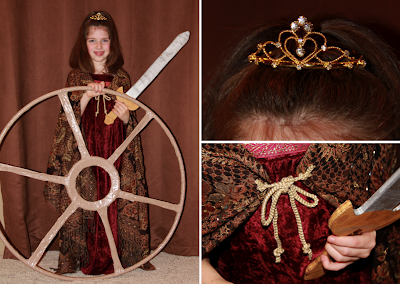 Last night I decided to try and make Twinkle Toes a "wheel" for her St. Catherine of Alexandria costume. I pulled out an old hula-hoop from my closet and some brown duct tape (I wasn't able to find any Wood Print tape locally), while Twinkle Toes went searching for "something round with a hole in the center." My back-up plan was to cut out the center of a thick paper plate, but I was thrilled when she came back from the garage with a "Smokey the Bear Frisbee Ring" that one of the kids had brought home from the BLM at some point. It was the perfect size! I wrapped the hula-hoop with the tape, wrapped and placed the frisbee in the center, created spokes with the tape, and then wrapped the spokes to make them a bit thicker. I used the whole roll of tape, and had just enough! 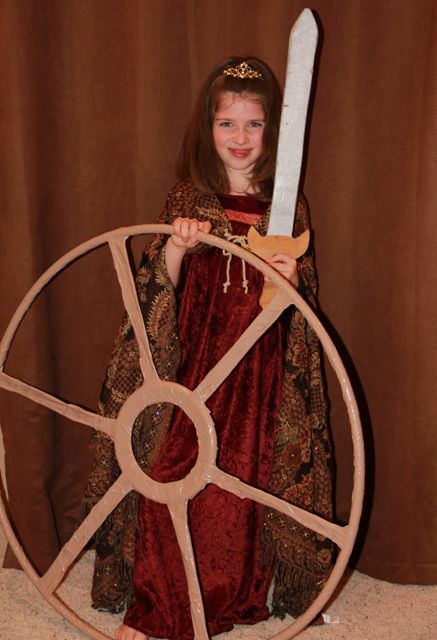 For a gown, Twinkle Toes decided to wear the burgundy one from her St. Margaret of Scotland costume in 2009. (I had ordered it extra big for Christmas in 2008, and it still fits!) We then pulled out an old brown beaded scarf of mine to make into a cloak. I had picked up a clasp, but either it never made it out of the store or it is hiding around here somewhere, so I improvised with the cords off a gift bag and some gold safety pins, to create a tie. We then finished her costume with one of her brother's swords and a pretty little Gold Tiara Crown, complete with hearts for St. Catherine! The tiara arrived much smaller than I had imagined, but it ended up working out nicely and Twinkle Toes is very excited about her costume! I still have a few costumes to finish up, but it looks like we are going to have St. Ignatius of Loyola, St. Francis Xavier, St. Catherine of Alexandria, Blessed Teresa of Calcutta, St. George the Dragon Slayer, and St. Cecilia. You can find other costume ideas in the archives including Saintly Costumes, A Costume for St. Maximilian Kolbe, and a St. Francis of Assisi Costume. You can also scroll through all of our past costume pictures here. I just love how much of your heart you put into every detail. Woman, you are amazing and so clever! Oh this did come out so good. I love the finds around the house to complete the look. Doesn't it make it so much nicer to accomplish this while being creative? You are creative beyound belief! The pictures of the costumes just make anyone's day! They are all so adorable and as in the past, you inspire so many with your gift of creativity. God bless and can't wait to see the party. Wish I was there too! We are waiting on the mammoth snow blizzard right now. Awesome job, Jessica!!! Your little saint looks amazing! Ugh. I am not even done getting the kids ready. I can't find a pair of white wings anywhere and Saint Michael did not have pink glittery wings. Sigh. this is so so creative Jessica. I love it! and Twinkle Toes makes the best St. Catherine of Alexandria I've ever seen! Oh dear, I am making a Catherine of Alexandria costume for a party this weekend and I don't have a hulu-hoop! THAT Is the best WHEEL EVER! Where did the child with the St. Lucy costume get her crown? I NEED one of those for the feast of St. Lucy! LOVED your party pictures! Must food for thought. Beautiful! Good luck with your costume! 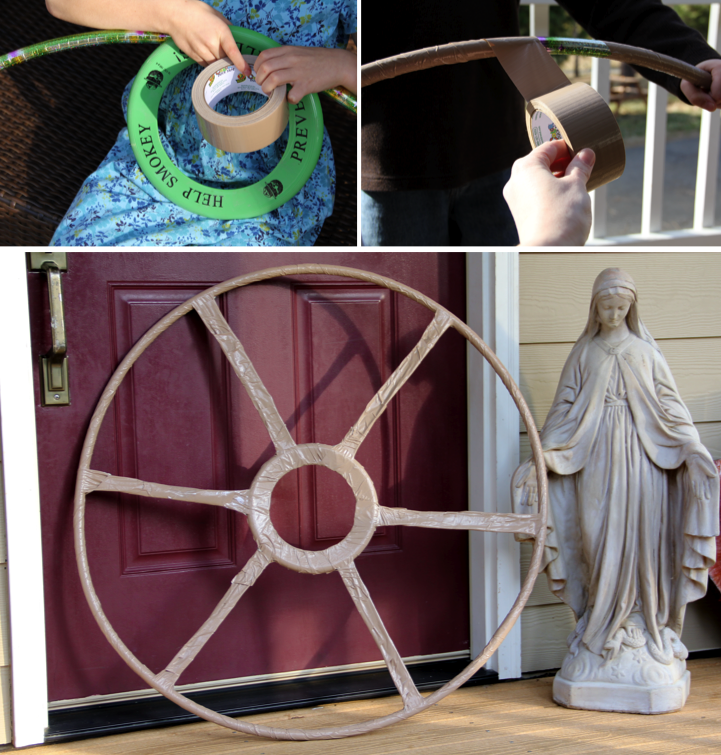 I hope you are able to find a hula-hoop - it really made making the wheel quick and easy! The St. Lucy crown that my daughter is wearing was a gift from a friend in Norway, for our St. Lucy Day Celebrations. Isn't it beautiful!?! We also have a green crown from the American Swedish Institute - perhaps you can find one that would work on their website?